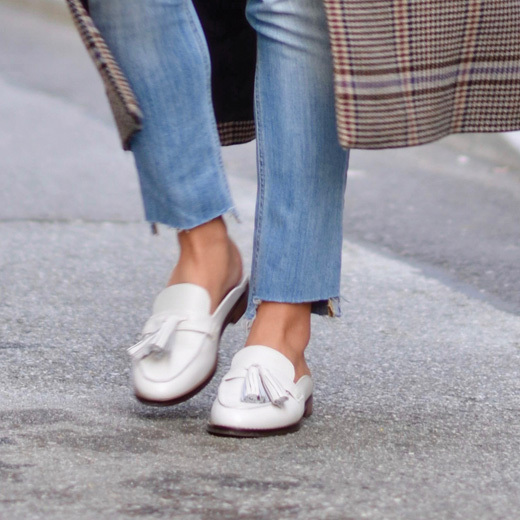 If you like the timeless look of tassel loafers, you’ll love sliding into our cushy Reagan Mule. A posh classic you can wear all day. Slide into style with the Reagan tasseled mule. Its leather or patent leather uppers and leather stacked heel give it a sleek-posh feel. Available in women's whole and half sizes 5, 6-10, 11. To preserve the appearance of your Vionic footwear, we recommend that you clean the leather, if needed, using a dry, cotton cloth to wipe away dirt or dust. An innovative approach to foot health, Vionic conceals biomechanical technology into every shoe. All-day comfort is a difference you can feel. I can’t wait to wear! These are as comfortable as they are pretty! I was a bit cautious to buy slip on shoes for work but I was pleasantly surprised once I tried on these shoes. They are classy and comfortable at the same time. I normally don't wear low heeled shoes because I have a high arch. So far, I have not had any arch issues since wearing them. They are not tight in the widest part of my foot. The shoe stays on and doesn't slip. They don't look cheap either. I’ve had these for about a month and I love wearing them. They are super cute and comfy! I had to return these lovely shoes because they were too loose for me. The length of my usual size 9 was perfect but the shoe itself was too loose. The arch support is not as high as my other Vionic sneakers but if these shoes fit you right the look is great and the quality of the leather and fabrication is great. I love this shoe! Comfortable and updated look. I did have to buy a half size smaller. Just bought the same pair in a different color this week! The shoes felt comfortable, but the sides gaped away from my foot and the tassels were out of proportion for my size 7 (too long). Love these shoes, everything about them! I am going to purchase in every color!